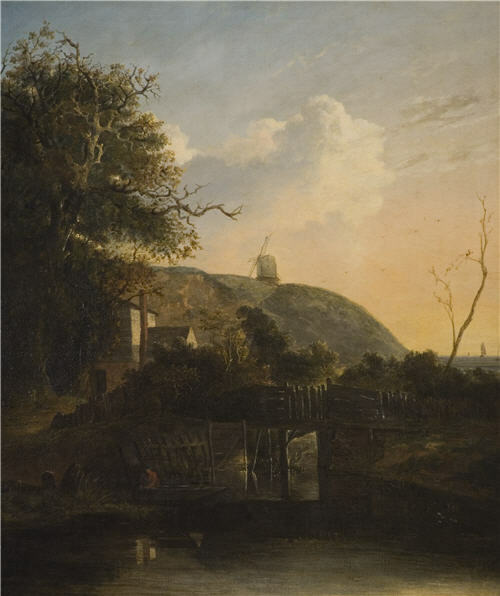 This painting was begun by John Crome about 1805/7, but it was overpainted by his son around 1832. The alterations were made so that it formed a pair with John Berney Crome’s Near Bury St Edmunds. The foreground and the building to the left are the only part of the elder Crome’s original still visible. The title is a traditional one and it has not been possible to identify the exact location. Father and son were leading painters of the Norwich School who were much influenced by 17th-century Dutch landscape painting.